March 31, 1934: Death of George A. Johnson. George A. Johnson was born in Auburn, Maine on May 26, 1874. From his involvement in the Louisville study with Fuller to his death in 1934, Johnson’s career was boosted by his association with George W. Fuller. Johnson never attended college and had no formal training as an engineer, chemist or bacteriologist. Johnson identified himself during his testimony in the second Jersey City trial as a “sanitary engineer,” which was clearly an overstatement of his accomplishments up to that point. By the time he became involved in the Boonton chloride of lime plant, he said that he had 14 years of experience as a sanitary engineer—since September 1895. The first three years of this period were devoted to working with George W. Fuller on the filtration studies in Louisville and Cincinnati. From reports of those studies, it was clear that Johnson was a laboratory technician and had no responsibilities or duties as a sanitary engineer. From 1899 on, Johnson became involved in some of the most interesting studies and implementation projects for filtration and sewage treatment in the U.S. under the guidance and supervision of George W. Fuller and Rudolph Hering. Project locations included York, PA, Norfolk, VA, Washington, DC, Philadelphia, PA, and St. Louis MO. “At many of the places mentioned my work embodied not only straight laboratory work of a bacterial and chemical nature, but also the practical operation of filtration works.” Clearly, from his own words, Johnson was a plant operator and lab technician who aspired to become a sanitary engineer someday through experience alone. Johnson had a supporting role in the great Chicago Drainage Canal case when he made investigations of the purported contamination caused by the discharge of Chicago’s rerouted sewage into the Mississippi 43 miles above the St. Louis water intake. He worked at the Little Falls treatment plant, helped conduct a sanitary survey of the Hudson River for New York City (with George C. Whipple) and investigated sewage treatment methods in Cleveland, OH in addition to water treatment methods for their water supply. Johnson took some time off in 1905-6 and traveled around the world. He visited water works in many countries and published a paper on his adventures when he returned. The paper is a curious recitation of unremarkable water works. It is hard to understand what a U.S. reader might learn from his description of the Calcutta waterworks. Calcutta is in the Ganges Valley which was the source for all of the horrifying cholera epidemics in the 19thcentury which killed millions of people around the world. When he returned to the U.S., he rejoined Hering and Fuller as Principal Assistant Engineer and he continued his work on water treatment and sewage disposal plants. During this period he operated the Boonton chloride of lime plant for three months in late 1908. He left the firm of Hering and Fuller in 1910 and formed the consulting firm Johnson and Fuller with William Barnard Fuller. He continued as a consultant for the rest of his career except for two years (1918-20) when he joined the U.S. Army where he managed fixed properties and utilities in the U.S. for the War Department. He was a member of a number of professional societies including the APHA and the AWWA. He received the Dexter Brackett Medal from the New England Water Works Association. He published many articles in professional journals during his career. He was a member of the Explorers Club and the Circumnavigators Club, where he edited its monthly publication, The Log,for many years. He died of a heart attack while working at his desk on March 31, 1934.George W. Fuller would die just two and one-half months later. Between the Mayor and Aldermen of Jersey City, Complainant, and Patrick H. Flynn and Jersey City Water Supply Company, Defendants: On Bill, etc. (In Chancery of New Jersey) 12 vols. n.p. :privately printed. 1908-10, (February 8, 1909, p. 5126). Commentary: Johnson took inappropriate credit for the first use of chlorine in a drinking water supply. He claimed to first use chlorine in the Bubbly Creek treatment plant which was used to treat water for cows and pigs. He then wrote about the chlorination of the water supply for Jersey City and either omitted the leadership of Dr. John L. Leal from his writings or emphasized improperly his own contributions. Dozens of secondary and tertiary sources have perpetuated the myth that Johnson started. Chapter 13 of The Chlorine Revolution examines this issue in full detail. This entry was posted in Year 7 TDIWH and tagged chloride of lime, chlorine, drinking water, George A. Johnson, George Warren Fuller, Jersey City, John L. Leal, public health, water, water history on March 31, 2019 by safedrinkingwaterdotcom. 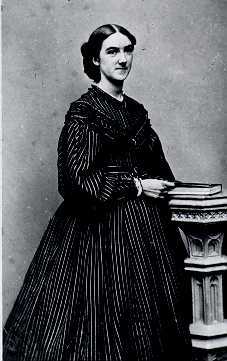 Commentary: There is a rich body of information about the life Ellen Swallow Richards. A video on YouTubewith ESR expert Joyce B. Milesnarrating is particularly interesting. 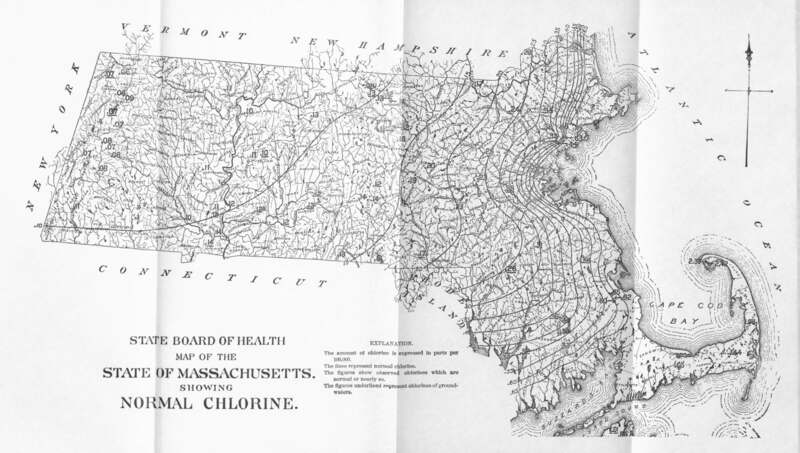 Below is the Normal Chlorine Map from a book by Ellen Swallow Richards. It shows that chloride concentrations in ground and surface waters increase as one nears the coastline of the Atlantic Ocean. Any significant deviations from the “normal” levels of chloride in a water source indicated sewage contamination. Reference: Durant, Elizabeth. (2007). “Ellencyclopedia.” MIT Technology Review. August 15, 2007. 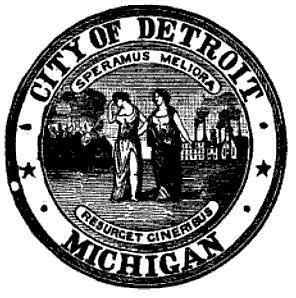 March 30, 1827: The Common Council of the city of Detroit passed an ordinance, which granted the right to supply the City with water to Rufus Wells. Wells expanded the modest waterworks in place into a system that supplied the City until 1850. “Wells’ water works was located on Berthelet’s wharf and featured two horse-driven pumps, which raised water into a 40-gallon cask on top of the pump house. Water flowed by gravity into Detroit’s first reservoir – a four-by-four foot structure filled to a depth of six feet, with a capacity of 9,580 imperial gallons – located on the corner of Jefferson and Randolph. Water was then distributed to residents through the city’s first water mains. Reference: Daisy, Michael (ed.) no date. “Detroit Water and Sewerage Department: The First 300 Years.” http://dwsd.org/downloads_n/about_dwsd/history/complete_history.pdf(Accessed November 23, 2013). This entry was posted in Year 7 TDIWH and tagged drinking water, Ellen Swallow Richards, MIT, normal chlorine map, public health, water, water history on March 30, 2019 by safedrinkingwaterdotcom. 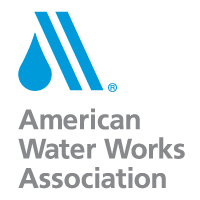 March 29, 1881: AWWA founded.“On March 29, 1881, in Engineers’ Hall on the campus of Washington University in St. Louis, Mo., 22 men representing water utilities in Illinois, Indiana, Iowa, Kansas, Kentucky, and Tennessee founded the American Water Works Association. This entry was posted in Year 7 TDIWH and tagged American Water Works Association, AWWA, drinking water, public health, St. Louis, water, water history on March 29, 2019 by safedrinkingwaterdotcom. 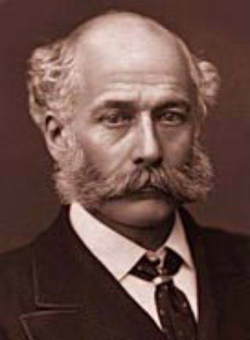 March 28, 1819: Birth of Joseph W. Bazalgette.“Sir Joseph William Bazalgette, CB (28 March 1819 – 15 March 1891) was an English civil engineer of the 19th century. As chief engineer of London’s Metropolitan Board of Works his major achievement was the creation (in response to the “Great Stink” of 1858) of a sewer network for central London which was instrumental in relieving the city from cholera epidemics, while beginning the cleansing of the River Thames. Commentary: Most accounts of the sewers that Bazalgette built claim that they solved the problems of cholera epidemics in London. They did not. All that the sewers did was transport the contamination more quickly to the Thames River. It was not until the water supplies in the UK were filtered (and ultimately disinfected) that the Sewer Pipe-Water Pipe Death Spiral was broken. This entry was posted in Year 7 TDIWH and tagged drinking water, Joseph W. Bazalgette, London, public health, sewers, water, water history on March 28, 2019 by safedrinkingwaterdotcom. March 27, 1807:Birth of James P. Kirkwood who authored the classic book Report on the Filtration of River Waters, which was the first book in any language to focus on the filtration of municipal water supplies. The book summarized his investigation covering 1865-69 where he described the filters and filter galleries he visited in 19 European water works. 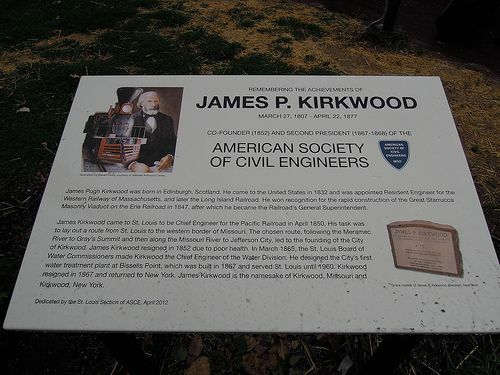 On this same date in 1865 (his 58th birthday), Kirkwood was appointed Chief Engineer by the Board of Water Commissioners for the City of St. Louis, MO. “James Pugh Kirkwood(27 March 1807 – 22 April 1877) was a 19th-century American civil engineer. He was born in Edinburgh, Scotland, on 27 March 1807. He worked for the Long Island Rail Road, and gained notice in 1848 for his construction of the Starrucca Viaduct near Lanesboro, Pennsylvania, considered to be the most expensive railroad bridge at the time, as well as the largest stone viaduct, and for its first use of concrete in American bridge construction. He arrived in St. Louis, Missouri, in 1850 as chief engineer of the Pacific Railroad, and was responsible for the construction of the road from St. Louis to Pacific, Missouri. The towns of Kirkwood, Missouri, and Kirkwood, New York, are named after him. In 1865 he was appointed Chief Engineer of St. Louis, Missouri, in charge of the design of a state-of-the-art waterworks. He served in that capacity until 1867, when he was replaced by Thomas Jefferson Whitman, brother of Walt Whitman. This entry was posted in Year 7 TDIWH and tagged drinking water, filtration, James P. Kirkwood, public health, water, water history on March 27, 2019 by safedrinkingwaterdotcom. March 26, 1914: Municipal Journalletter to the editor. 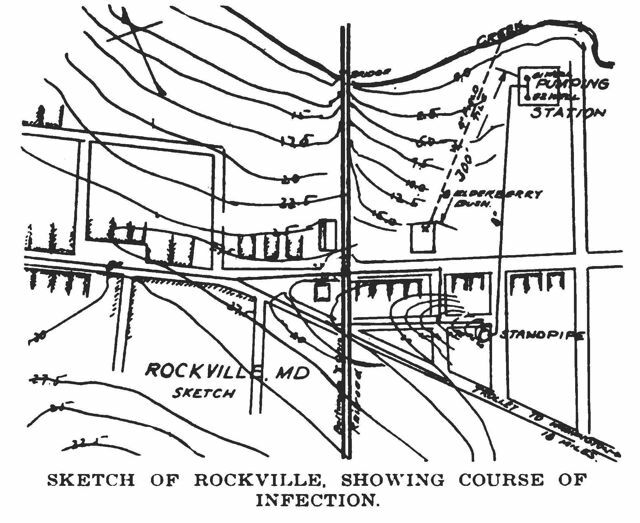 Typhoid Epidemic at Rockville, MD. “Prof. 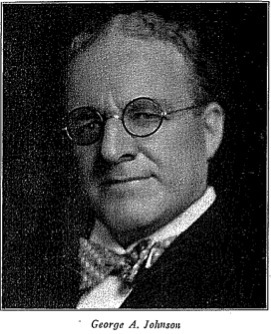 Earle B. Phelps for the United States Government at Washington, Robert B. Morse, chief engineer Maryland State Board of Health, a number of others and the writer were recently called upon by the authorities at Rockville to inquire into and alleviate a typhoid epidemic in which two per cent. of the entire population were stricken with the disease. There have been more than 20 cases, but to date there have been no deaths. Rockville, a small town of 1,100 inhabitants, lies about 18 miles distant from Washington, D. C. It is built on the backbone of a ridge draining into three watersheds. Since 1897 the town has operated its own waterworks, obtaining a supply from two driven wells about 40 feet apart and some 225 feet deep, located in the valley in the direct line of the storm water run off from the town which takes approximately one-half the runoff. The district surrounding the pumping station is sparsely built up, the town is unsewered and has few storm water drains. Kitchen and bath wastes are permitted to pass into the street and down the gutter. Cesspools and open closets dot the hillside. 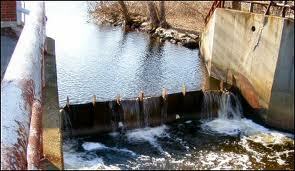 A small stream passing near the pumping station serves as an outlet for floods, kitchen wastes, etc. The normal flow of the creek does not exceed 4 cubic feet per minute. The soil formation is clay (disintegrated rock), which is in turn underlaid with rock in layers, the seams of the rock containing clay, broken stone, etc., and in some instances forming open crevices and pockets…. The wells have been in service for nearly 17 years and the people have, until now, suffered no ill therefrom. However, after the installation of the supply, it was noticed from time to time during large storms that inundated the valley, that No. 1 well occasionally supplied turbid water. It was noticed further, that by pumping No. 1 well continuously for several hours, the water level was lowered very materially in well No. 2. Also that when No. 2 well was pumped the water was never turbid. and that the water level in well No. 1 was very little affected. Well No. 1 always seemed to have a surplus of water, whereas well No. 2 dropped fully 70 feet, in fact to such depth that the deep well pump would just draw all the well flowed. This information should have indicated at once both to the town authorities and the public that No. 1 well was drawing from a surface supply; that the well was not tight, and that it should have been fixed or abandoned. The sketch enclosed shows the approximate location of pumping station, creek, topography of ground and position of nearest dwellings….About one hour after the water containing dye would flood the elderberry bush the dye would appear in well No. 1. When examined, this water showed gross pollution, whereas water in well No. 2 gave practically no indication of pollution. More than a week was consumed in locating the source of pollution. The first home in which the typhoid had occurred was the one nearest the wells and the one which was polluting the well. Reference: Hatton, Herbert W. 1914. Letter to the Editor. Municipal Journal.36:13(March 26, 1914): 428-9. Commentary: Well No. 1 would certainly qualify today as a Ground Water Under the Direct Influence of Surface Water. If anyone wonders why state health departments make such a big deal out of GWUDISW, they should read this article. Earle B. Phelps was one of the expert witnesses in the second Jersey City trial that evaluated the use of chlorine for drinking water disinfection. He opposed the use of chlorine in 1909, but he seems to have come around five years later. This entry was posted in Year 7 TDIWH and tagged drinking water, Earle B. Phelps, groundwater, GWUDISW, Maryland, public health, Rockville, typhoid, water, water history on March 26, 2019 by safedrinkingwaterdotcom.